Handy Password manager has the best integration with the Internet Explorer browser. If you use Internet Explorer as your default browser, we suggest that you try out Novosoft's password management software, Handy Password. 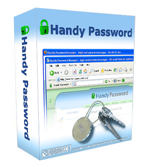 The Handy Password toolbar is smoothly integrated into Internet Explorer adding to it several useful features such as grouped bookmarks, personal information database, the save password function, and a random password generator. While surfing the web you often have to type and save a lot of passwords that are needed to open accounts, enter chat rooms and blogs, make online purchases and what not. Thus you may have to save a lot of passwords, which can be rather cumbersome if you do it manually. If this is the case, then you are definitely in need of a reliable password saving tool which works fine with Internet Explorer. Handy Password manager is just that kind of program. It allows to save Internet Explorer passwords to a secure database and storing them with all possible security under the protection of your master password so no third party can ever access it. The Handy Password toolbar is added to the Internet Explorer menu bar and allows you to perform a number of actions, including saving your passwords, filling and submitting forms automatically etc. This and other features of Internet Explorer add-on will improve your web browsing experience and allow you to enjoy web surfing to the utmost. Do not hesitate to try Handy Password on your Internet Explorer and you will soon appreciate the convenience of auto fill forms and password keeper function!